This is the place to post your favorite SRK fan videos. Edit: youtubelink: please do not share on any social network - thanks! Only via e-mail with friends of yours. I'm trying to get used to using the Like button... but I don't know if the poster ever sees them. 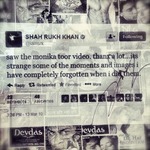 Not so new anymore, but the video Shahrukh saw and tweeted about! Thanks Monika! Fantastic video! I enjoyed watching it a lot! Monika - I like you video very much too. It's great! Great video and great song....thanks for uploading it! Debbie - thank you - thats very kind of you! After quite some time I've finally made a new video. I was inspired by Shahrukh and Deepika's "burning" hot chemistry in the new Happy New Year promos and made my new video, Kinna Sohna. I hope you all like it! After quite some time I've finally made a new video. I was inspired by Shahrukh and Deepika's chemistry in the new Happy New Year promos and made my new video, Kinna Sohna. Check it out, I hope you all like it! Alexxa, that video was stunning. I'm not such a 'fan' of fan videos, but yours was so so good and captured the film and the song. Bravo. I juste made a kind of video editing about SRK, with his best songs. It's a little long...but I hope you'll like it ! OmShanti - Living The Dream, edited by me. If you like it.. Please share it.